Insurance savings plans or Endowment plans are plans designed by insurance companies with an objective to provide and meet long term saving goals. The assured (in this case you, or someone) pays the insurance company a fixed sum of money monthly, quarterly or yearly, or a one time amount. Return you a sum of money upon maturity, which could be 15, 20 or 30 years. This is getting less common. Most insurance savings plans are more flexible. I am always fascinated about the returns of endowments. They are sold to us as a great instrument to meet certain long term saving goals such as children’s University tuition fees, retirement. The illustrations by the insurance agents and company often tout that their insurance saving plans yield 3 to 5% returns. As a data driven person, I wonder if the reality of the returns is close to this. If they are close to this range of returns then they are decent saving products. They are doing what they are being touted. However, if they do not then the majority of the savers are being sold a hope. I grew skeptical when two of my acquaintances told me their saving endowment yields them a low amount in return. One of my acquaintance is a project manager. He said that his endowment from Great Eastern is losing money since he bought the savings policy in 1993 and matured in 2013 (20 years). I took a look and it turns out he is not losing money. But the annualized return is 0.9%. I was taken a back by that figure. I thought I have not factoring in some cash back. Another reader then shared with me her policy bought during the period. Her calculation was that it yields here roughly 1%. It should be noted that this reader of mine was rather well verse in finance so I wasn’t expecting any mistake when she say the returns were low. I was astounded with the returns shared with me. Endowment primarily invests in fixed income or bonds and for the majority the rates have been falling which means values are going up. 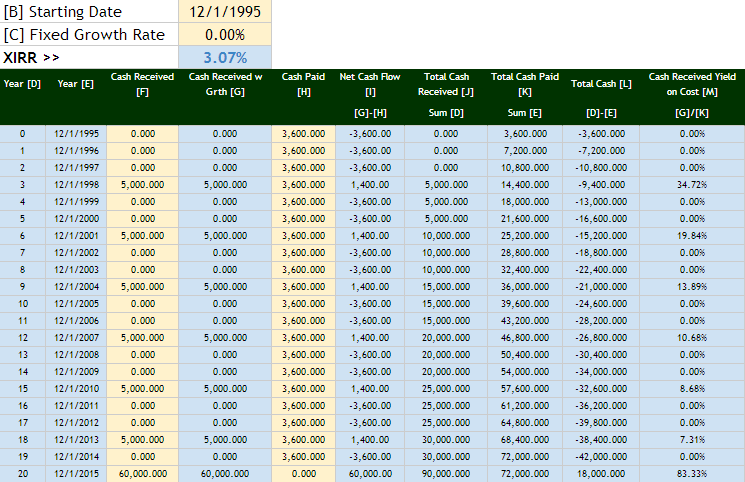 Also in this period you could possibly still invest in 10 to 15 year duration bonds yielding 3 to 4%. 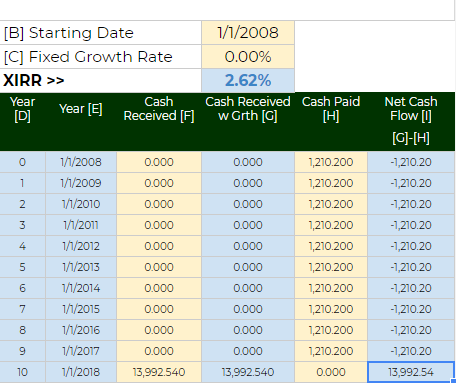 The returns from these 2 savings plans are not high but also not as low as they described. The returns are close to the corporate bond of safer blue chip companies. 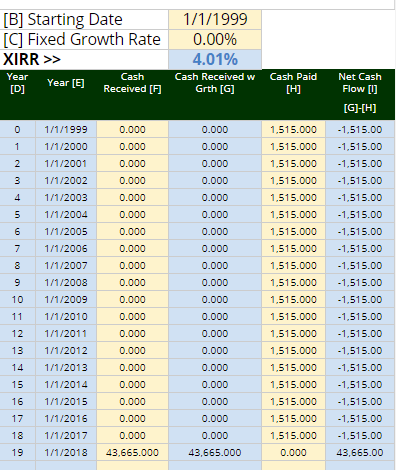 It is strange that whether it is 5 years, 10 years or 18 years, the returns per year based on XIRR we get are quite similar (3.2%, 2.76% and 2.96%). 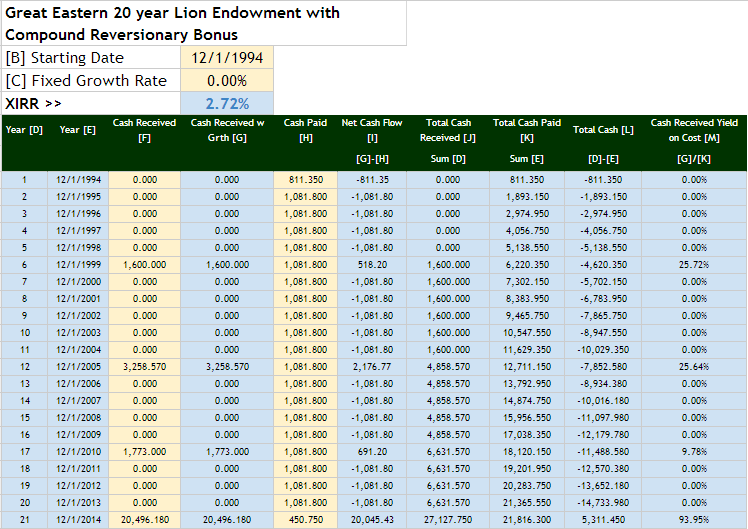 I would expect the returns for a longer duration savings endowment to be higher. The problem for most of us is that the actual returns that policy holders get are not readily available. Insurance companies only revealed the returns of their participating policies. However, that is not the returns the policy holders enjoyed. 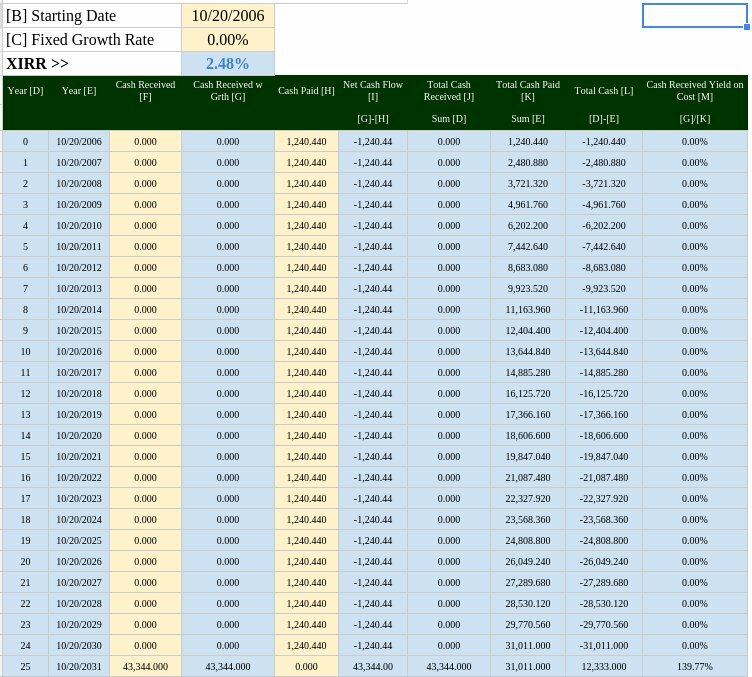 You still have to deduct distribution costs from these investment returns. If the returns are around 3 to 5%, I like it. For this group of wealth builders, if you can give them such a return, its not too bad. The problem is that non-guaranteed returns projection is very, non-guaranteed. We would like to consolidate a data bank of past matured endowment returns so that, we, the wealth builders, can be better informed. You can comment below or email me at [email protected] and tell me your thoughts of past endowments you bought, or friends, parents or acquaintance bought. I am looking for policies that have matured. This means the policies that you have closed down, and received terminal bonuses for. Let’s make this a project for you and me. Through the years, I got questions about how they bought these policies when they were less informed and have problems sorting out whether they should cancel or not these policies. I think a lot of times the answer is that they should not do such a drastic thing. These policies can be part of your holistic wealth building plan. But you need to sort out your overall wealth building plan. You can do it the do it yourself (DIY) way, or you could also sort out a trusted financial planner. The problem about the later is that its tough to find one out there. 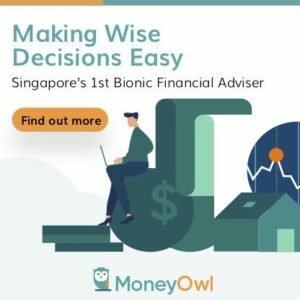 If you want my personal recommendation, you could work with my friends at Providend, who are Fee Only Financial Planners or you can work with my friend Wilfred Ling, who is a fee based financial planner. Both have appeared enough in media publications dispensing holistic financial advice as well as nuance ones. Check out some of the knowledge I absorbed from Wilfred here, here. The link to Wilfred is an affiliate link where you can get 20% off his advice package. Wilfred may or may not be the right fit, but if you set up a call with him, with his experience he could ascertain whether you could DIY your way through, or his help would be more beneficial to you. If things do not work out, you do not have to pay anything. Usually readers I know gain a lot from that first phone call as well. From this point in the article on, you can check out the name of the insurance endowment, and its return over the duration contributed by readers from the first time round. If you contribute your friends and family’s policies to the crowd sourced data, I will add them below. 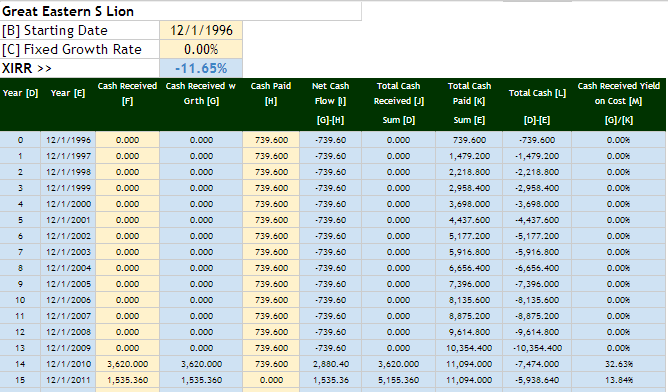 If you see a spreadsheet table showing an XIRR. That is my standard of measuring the return of an insurance endowment over the period. Think of XIRR as a methodology of computing the various cash inflow and outflow between you and the insurance plan such that we derive the annual interest rate of this insurance policy. A contribution from a Reader: The $5818 maturity value is similar to the guaranteed + non-guaranteed value on the policy Benefit Illustration. 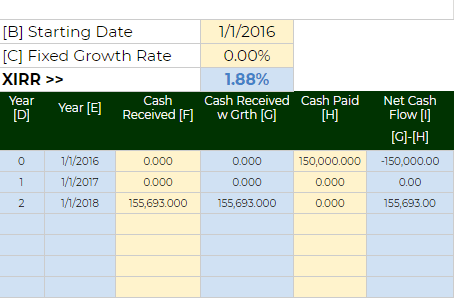 TM does live up to its reputation of meeting bonus forecasts. This is a Facebook Reader with his father’s 20 year Endowment which just matured this year! 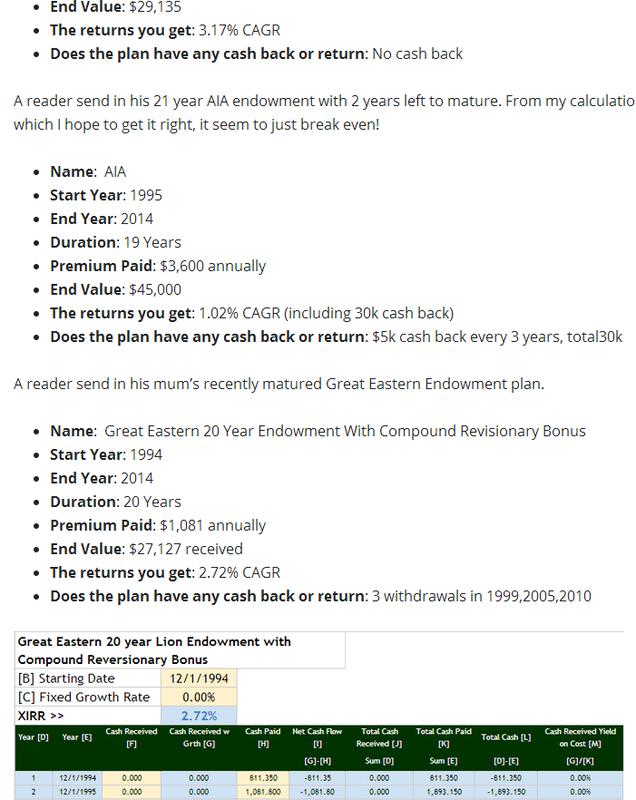 A reader send in his 21 year AIA endowment with 2 years left to mature. The current surrender value is $45,000 From my calculation, which I hope to get it right, it seem to just break even! But the projected final amount will be around $60,000. A reader send in his mum’s recently matured Great Eastern Endowment plan. 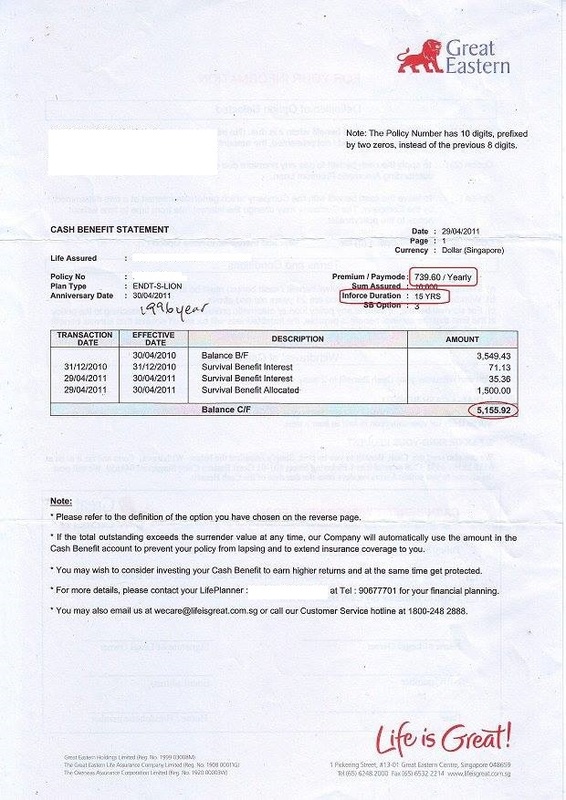 This reader sent in a 20 year NTUC policy. I am starting to think NTUC have the most lucrative historical policies. 2015 July 08: A reader was kind enough to let us share 2 of his 25 year old endowment policies. These policies have matured. In 2019, some readers sent me more policies. This kind lady sent me an NTUC insurance endowment she bought for her child when the child was 2. Now the child has some education fund. 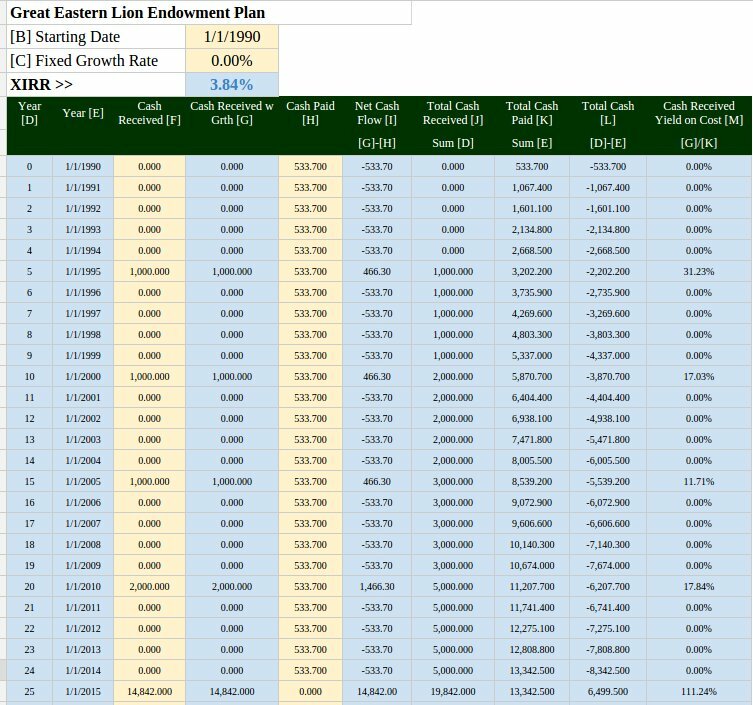 Back in April last year, I decide to crowd sourced readers, friends’ matured insurance endowment policies to see how much they are really yielding. It was a fruitful exercise, with the biggest lesson is that, the average folks probably are not equipped with an internal rate of return calculator or how to go about computing the returns of money going into the policy and money given from the policy. Due to that, they might see that the return for policies to be lower than what it is really yielding. This week, I have a reader who has 2 recently matured 25 year endowment plans. Out of all the plans, think I didn’t have 25 year plans. By right, the longer the duration, the more you should be compensated. And that means the returns should expected to be higher. Given that in the past the rates of bonds, the major underlying instruments, should have a better yield compared to now, they should be expected to be higher. I was surprised that the NTUC policy was computed to be less than 4%. NTUC have always illustrated that their yield to be rather high. For policies of this duration, my thoughts were that they should be yielding 4% at least. A friend of mine also pass along his friends’ updates on a 25 year old insurance endowment plan. It commerce in 2006, and will contribute $1,240 per year with cash back. The benefits illustration lists that the cash back if reinvested will grow at 3% while the returns will depend on the returns of the projected investment returns of 3.75% or 6.75%. Based on the BI, the project return is $44,428. The person chose not to take any cash back and in a recent update, the projected return at the end of the policy is estimated to be $43,344. It seems as the years past, the yields of the policies all start tapering down. 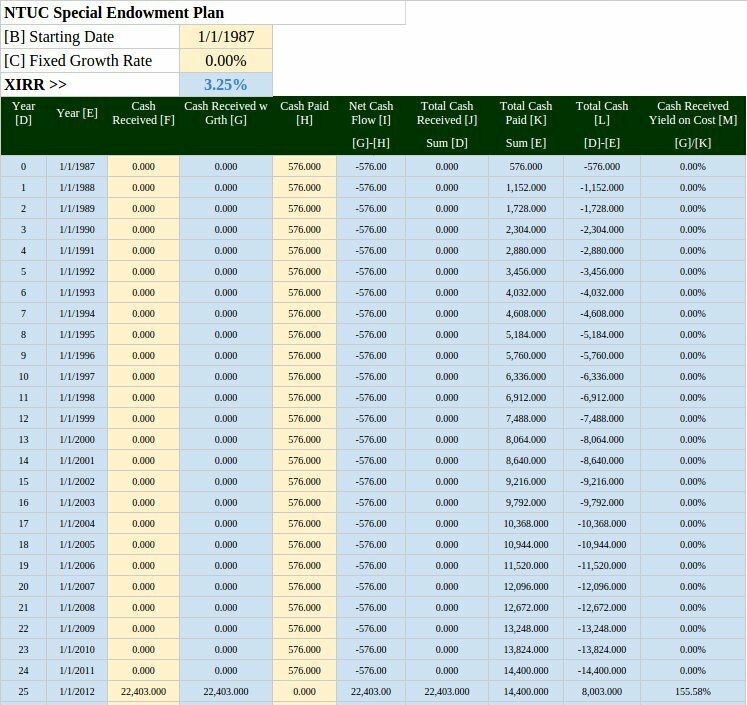 By the time we buy today, would our insurance endowment compounded yield to be less than 2%? You can reference the yields of previous policies profiled in this article here. If you are interested in sharing a matured policy of yourself, friends or family member, do comment below or email me. 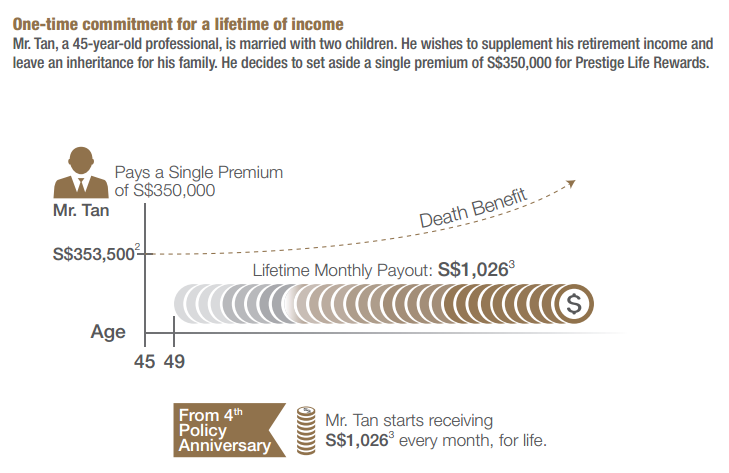 Would this be a good 20-25 year wealth building return for yourself and loved ones? 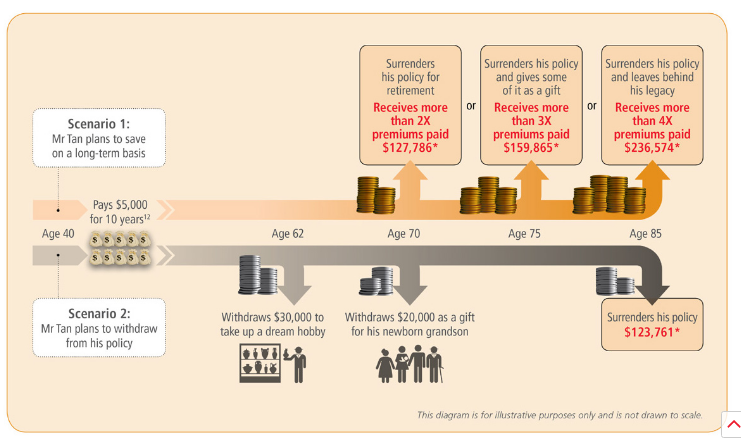 Here is an Insurance Saving Plan (Endowment) that actually lost money! I posted 1 week ago of something I want to gather regarding something I was curious about. The insurance policy that we were pestered to purchase from the sellers at MRT stations or from your trusted personal advisor, do they promised the high returns in the projection? You can take a look at the result here at the bottom section of this post. A policy that actually lost money? What was surprising is that I never expected them to lose money. I thought its not possible. The participating fund or the underlying instrument should invest in bonds and when they matured they should be in the black, even at worse they lose out to inflation. You can see clearly the premium paying mode that its $739 per year. And the amount that they gotten back. I probed whether there are cash back that they forgotten and the reader told me there shouldn’t be. 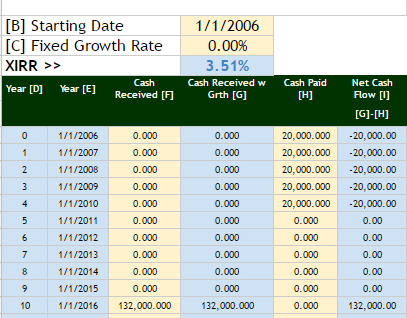 Even if I factored in a $300 per year cash back (very generous), it is still negative. This actually means per year compounded, the money shrank 11.65% per year. I have particular high confidence in the financial interpretation ability of this reader so this is really surprising. 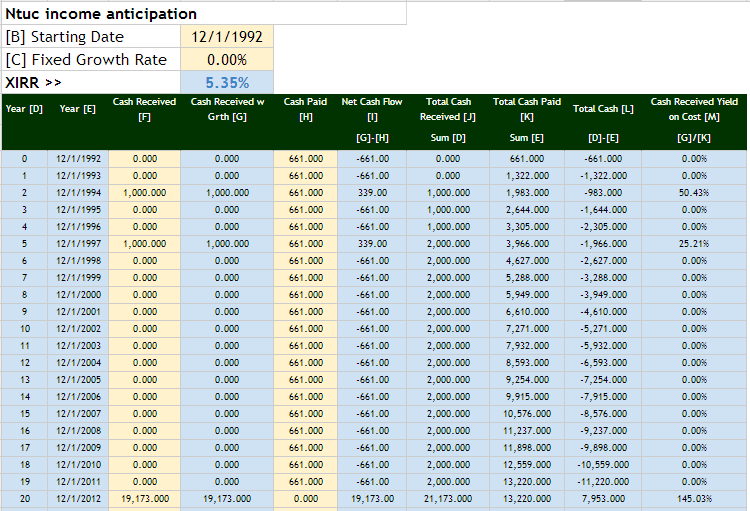 It appears to be an anticipated endowment with the option of leaving the yearly cash with GE earning an interest. 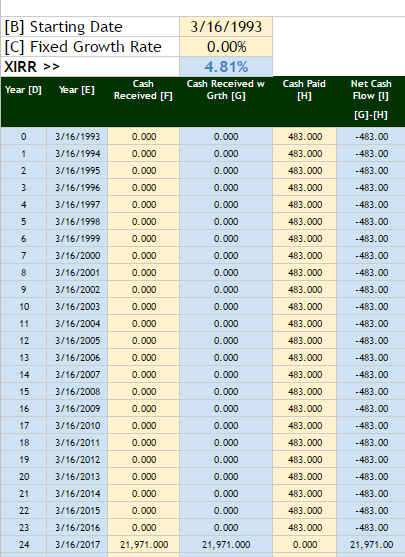 The cash statement shown on the website is for the cash portion that was deposited back with GE. There should be a separate statement to show the maturity value with the bonuses declared and terminal bonuses. Another reader who is in the industry also clarified. The problem is that the family do not remember receiving the matured sum. In this case, I have a strong hunch that this is likely a case of our misinterpretation. That is the problem when we don’t keep all the records. Let me know if you have friends or family members who say they lost money on their insurance. I find that a lot of the time is, we are so mathematically challenged that we cannot tell that the returns are actually more than the appalling nature folks make them out to be.